5/18/2016: after yesterday, everyone feared the rain. Duffel bags were light- everyone was wearing layers for warmth and rain gear i.e. booties, head protection(often the bathroom shower cap), jackets, and gloves. 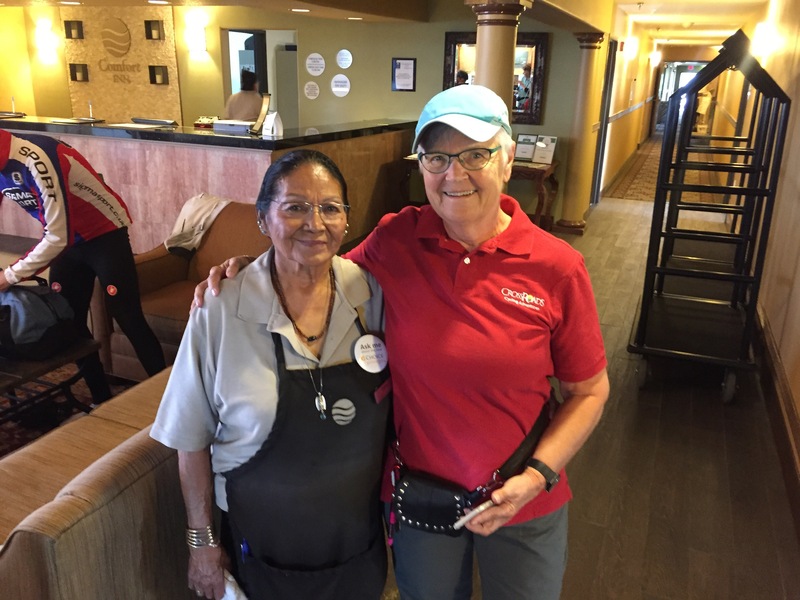 The hotel was great – a comfort inn and the Navajo women helping with breakfast was excited about yesterday’s rain. She a veggie gardener- like myself. She was describing her corn – 5 colors for use during tribal ceremonies. Took a photo of her and Jan- one of our great support team. 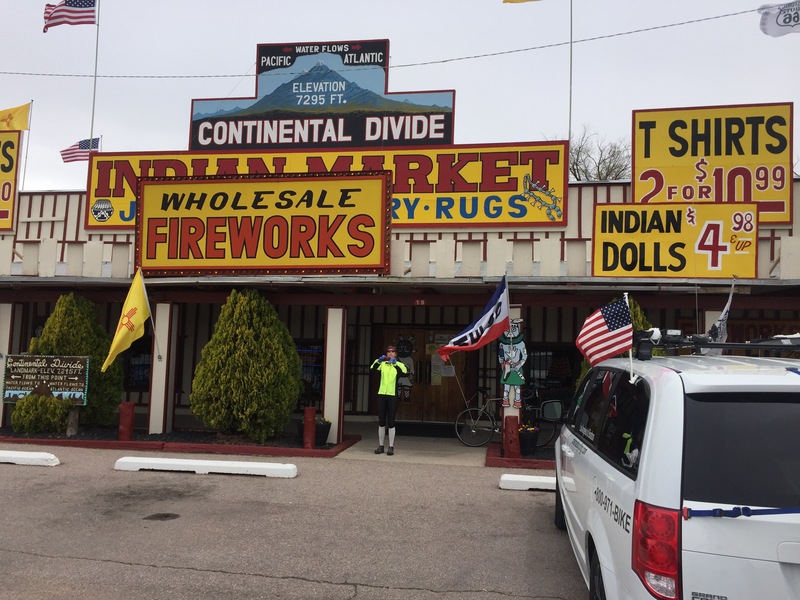 The Day itself went from cloudy/ clear to cool – Especially When we cross the Continental Divide.- coldest spot today in the 40’s. Great SAG there- more pie!! 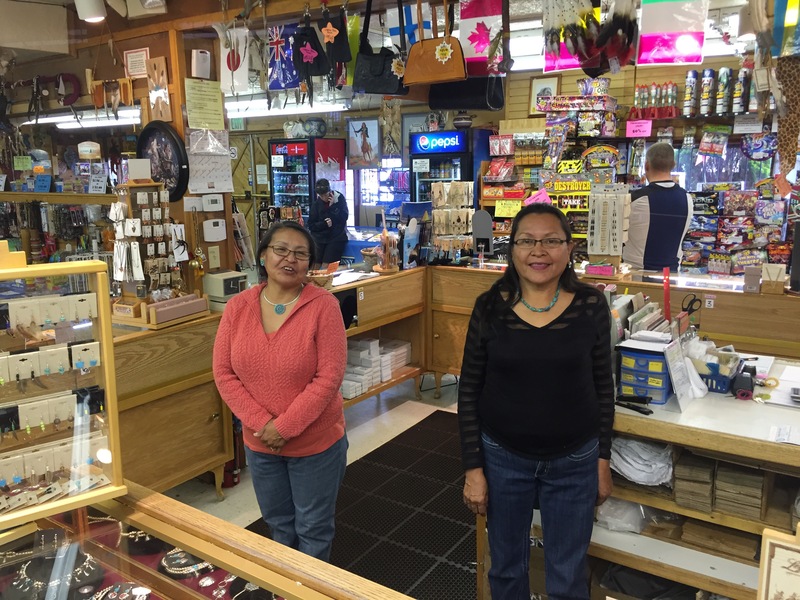 The Indian souvenir shop was full of great stuff but even better – the two ladies behind the counter. Native Navajo- very soft spoken, laughed a lot and were quick to jump in w me for a picture. They were tiny indeed. The ride into Grant was tough, no rain, see you prepare and nothing happens, but there was a continuous 15-20 mph wind in your face. 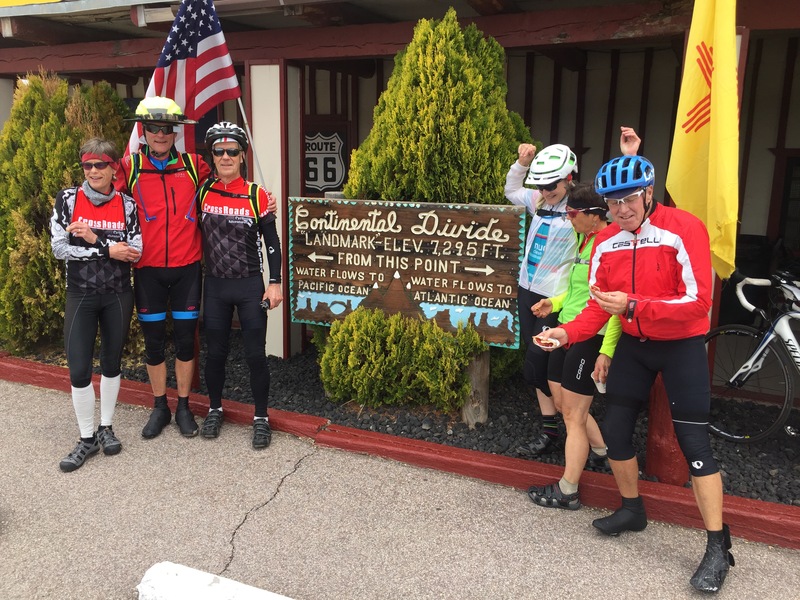 One rider on the trip, Chuck, has done the ride 3 times. He said the ride today was the toughest he ever experienced into Grant. 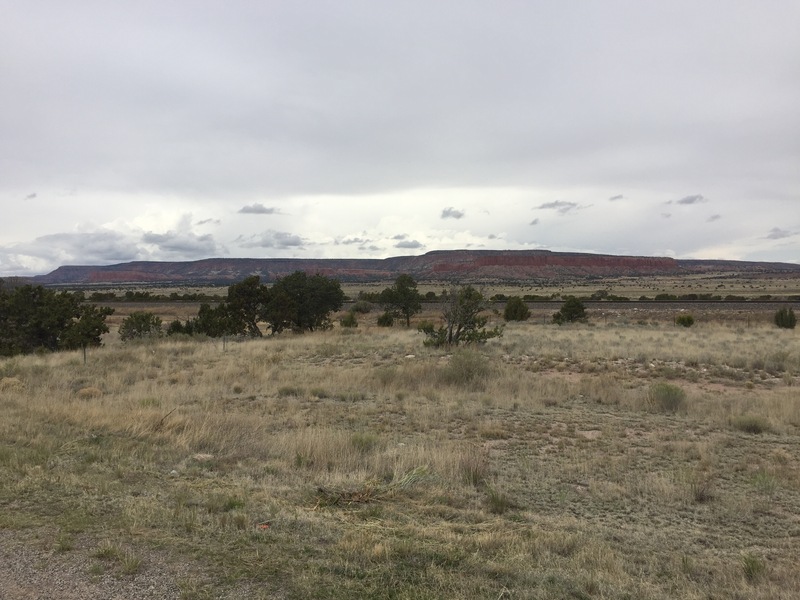 Beautiful Mesas were out into the distance as we rode and an amazing number of trains. 4-5 engines pulling stacked shipping cars-almost all heading West, wonder why folks!! 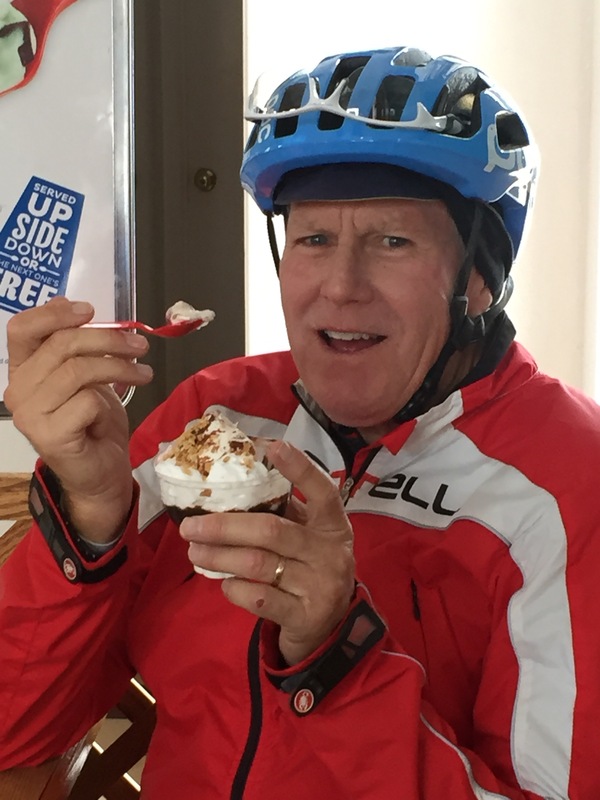 A quick stop at the DQ – again! Then, Diner at Denny’s – we going top shelf today! Terrific photos. Keep it up Jim and company. 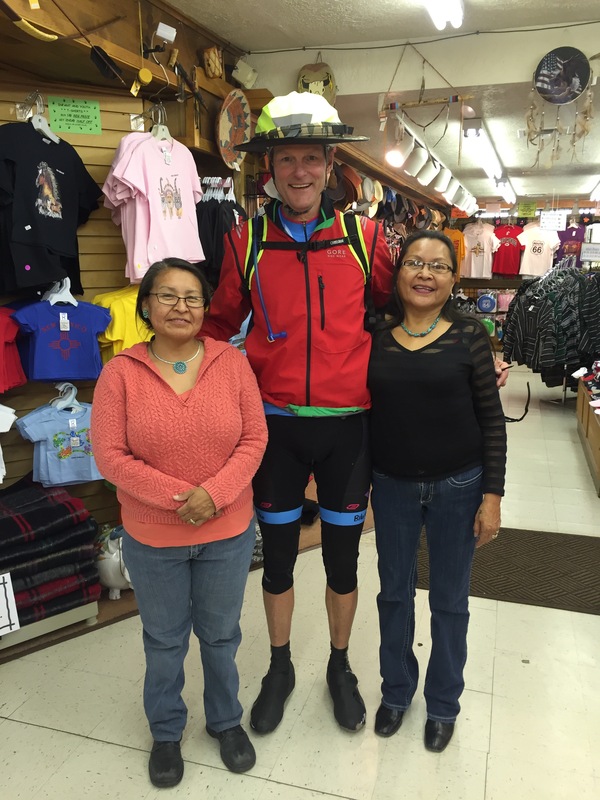 Did the Navajo ladies like your brimmed bike helmet? I came off looking like Mary Poppins- and yet it was a good luck charm- no rain fell! Susan – we have a gal riding with us that reminds me so of you. East Coast now, smart, quick wit, talks a ton (compliment) and is a killer on the bike!! Her comment today- why don’ t men talk much– we laughed. There’s no room to!! You look like the jolly red giant next to your new girlfriends!!! Sounds like your day was a nice one compared to yesterday!! The country is sooo beautful. I just love the desert / just not the cold. Miss you but you are having such an amazing experience. We are all rooting for you. Love hugs and kisses. PS Maya says hi! Not a bit of jealousy– they are a bit short for me, and not nearly as good looking as you Denise!! I know a great thing when I got it!, Hope the cat is keeping you warm- save me a spot!!! Hi Jimmy!!! Just saw your story on the O’Hara Facebook page. Good luck from a friend from long ago. Jeannie- wow!! I love it , for years I have wondered where you were. This is so cool to hear from you. Keep commenting when you can- can’t wait. Enjoy my ride!! Going all the way back to grade school makes this special. You all have been passing thru some of the best country out west. Although out of your way, places like Walnut Cyn Natl. Monument, Wupatki, Sunset Meteor Crater would have been wonderful sites to visit. Maybe another time! And if you have fallen in love with the Navajos, I recommend the author Tony Hillerman (all 18 of his works) to learn as much as you’d ever wanna learn about the Dine culture, religion, and mythology. He was even made an honorary member of the Navajo Nation.